All tracks produced in Leipzig, May 2009 - Oct 2010. 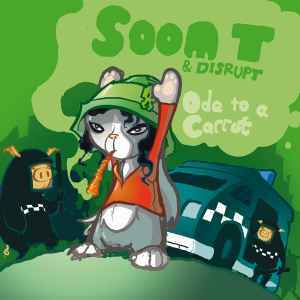 On the front sleeve the title appears as "Ode To A Carrot" while on the spine it's "Ode 2 A Carrot". This is one of the best reggae fusion albums out there. Not just Soom T as a vocalist tho, because the entire Jahtari library should be heard - as most of their stuff is on par with this album. The mixture of chiptune and reggae is, what I can only describe as: rewarding. Smoke up and bump this STAT. I am so hoping this one will once get repressed as the prices are insane. I love this beautiful album ! ! ! ! ! ! The best album of the last 5 years. You get never enough of it. Soom T is a brilliant and unique singer. Hope there is some upcoming stuff from her with the Jahtari crew. Brilliant and unique LP sounding like middle 80s just back in days when tempo riddim ruled the dancehall in JA. Absolutely recommended!